From a bridge that makes walking an adventure to a cost-effective way to revitalize an aging port, Architizer’s A+ Awards announced yesterday include smart and simple architecture for everyday life. Here are a few public structures that make grand statements about our changing cities or solve a universal problem in a beautiful way. The annual A+ awards are always a treat for their innovative, sustainable design solutions, honoring hundreds of projects worldwide. I plucked a few favorites from the urbanism and transportation world, but you can check out the the rest of the winners over at the A+ site. 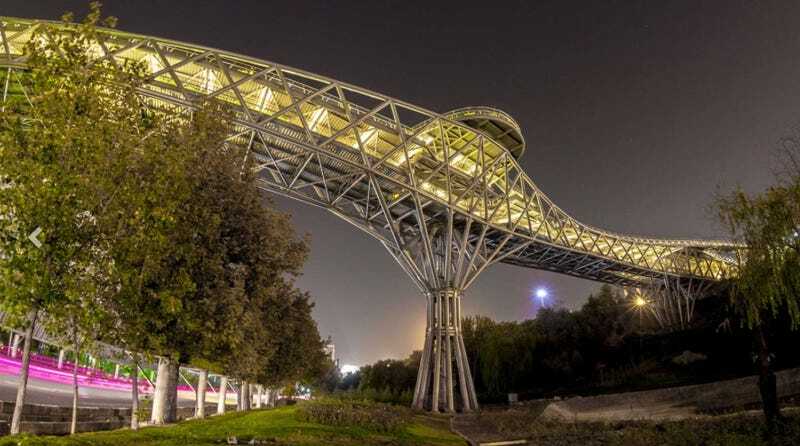 Instead of simply designing a single span to connect two public parks in Tehran divided by a freeway, the architects decided to turn the crossing into more of an adventure. The multiple levels and paths of varying widths act almost as optical illusions, encouraging walkers to keep exploring and discover new routes. For those who need to take a break along the way, there are plenty of seating areas as well as restaurants tucked into the lowest level. The resulting space is an utter urban delight where a boring bridge might have been. This 1,500 foot interpretive skywalk swings out over a majestic vista in the Canadian Rockies. The unique spot in Jasper National Park demands this unobstructed view so visitors can see all sides of the Continental Divide—not only the watersheds for the Pacific and Atlantic Oceans but the Arctic Ocean as well. The steel and tempered glass parabola is anchored to the cliff without any additional cables or supports. This giant infrastructure project onnecting Miami’s port to nearby freeways includes two 4,200-foot tunnels which travel far below Biscayne Bay. Instead of a joyless entrance and dreary interior, the architects and engineers worked together to create a dramatic piece of civic art. Unfinished concrete and bright orange steel accents greet drivers as they disappear under the ground. Inside, wayfinding graphics that include different colors denoting depth as well as the corresponding sealife both entertain drivers and give them a kind of progress bar on their passage below the ocean. The new terminal at Mumbai’s airport will serve 40 million passengers a year in a sustainable, transit-friendly space. The design features a single 750,000 square-foot room with one of the largest roofs in the world, which would be impressive enough even without the fact that it’s anchored by only 30 columns. These columns also served as hoisting mechanisms during construction so tower cranes did not need to be assembled on-site. The Uljanik shipyard in the Croatian city of Pula was built in 1856 and remains one of the oldest working shipyards in the world. An evening light show that transforms the hulking cranes into giant abstract creatures was envisioned to draw attention to the history and beauty of the city’s port. This incredibly simple idea which could help revitalize an industrial corner of any city was achieved with only 73 LED spotlights which are programmed to illuminate the horizon every evening. Since the cranes change positions during the day, it’s never the same scene twice. This “hotel” is actually a trailer designed to slip seamlessly into the alleyways and other vacant spaces of the South Korean city of Gwangju—a kind of Airbnb on wheels. Commissioned for an art biennial to encourage urban interaction, the trailer is designed to spark conversations about how the neighborhood is changing but also provide a statement on how we choose to use public space. Inside, it’s a pleasant study in tiny house living and can actually be used for accommodations. What looks like a simple bridge in the Austrian Alps is actually part of a much larger infrastructural upgrade for this scenic road for sightseers. The new span had to signal to drivers that the new bridge was sturdy yet blend seamlessly into the steep canyon as to not ruin the view. The solution was a cast-concrete design that demonstrates its strength with a soaring arch yet feels like it’s been there forever. A gorgeous outdoor theater in this Norwegian valley was built specifically for a play about a shaman named Klemet who turned the region into a drum. Appropriately, the idyllic setting creates a light touch on the natural landscape. Towers made from wood salvaged from local abandoned houses provide lighting and sound support, and seating is made from local tree stumps donated by mills.